The following is a list of food and drink options in Aruba based on the experience of our property owners as well as what our prior guests have recommended. You have another recommendation? Let us know so we can share. A great dutch supermarket is Superfood. They are located on the northern side of the island and great fresh breads. great selection of cheeses, meats and fruit. Also has a wine and liquor shop. A fresh fish shop and botch (pharmacy) are located outside the super market. Another option is Ling and Sons. They are located closer to downtown Oranjestad. They accept American Express and will deliver groceries to your door for a small fee. They stock many American favorites and have an excellent selection of wines. One of our favorite local joints is Zeerovers in Savaneta. They have fresh fish and shrimp. Located right on the water where you can eat on a pier surrounded by file fish and the occasional porcupine fish. Reasonable prices and a cool local quite casual experience. Closed on Monday for cleaning and extremely busy on the weekends. Sundays they peel the shrimp for you. Ricardo's has a happy hour everyday from 4pm to 6pm then again from 10pm to midnight. Half price on all beer and mixed drinks. Also Monday is all you can ear Ribs and they are fantastic. 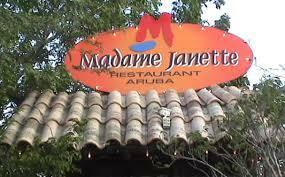 One of Aruba's fine dining options. Located in a quiet residential neighbor. Fun beach atmosphere with live band on Sunday evenings. Located between the Marriott and the Holiday Inn beach side. El Gaucho has some of the best steaks on the island. Located downtown Oranjestad. Dine and relax with your bare feet in soft white sand as you enjoy the calming sounds of the ocean caressing the shore, soft light from the tiki torches and a good glass of wine while you watch the sun set. That's Passions on the Beach, the most romantic dinner experience on the island. Located at Eagle Beach across from the Amsterdam Manor Beach Resort. G&G; is located in Savaneta. Thursdays is their special wing day. After a nice snorkel at Spanish Lagoon you either eat in or take out some fantastic wings. They have have many flavors to choose from. You better be prepared for HOT if you select "Slap Yo Mama".